Note: The 8301 Paging Adapter and Scheduler typically acts as the master paging device in your ENA SmartVoice system. To avoid service interruption, please consult with your ENA Voice Engineer if you would like to adjust any settings other than Schedules and Calendar. This includes paging zone and volume changes. Following the device install, your ENA SmartVoice Engineer or Project Manager will provide you with the IP address and password for your Algo 8301. To access the web interface, point your browser to the IP address provided and enter the password provided. 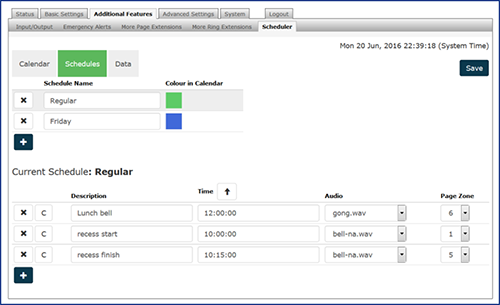 Click + to add a bell schedule that will be implemented on specific calendar days. Give a Schedule Name and pick a Colour in Calendar to represent the schedule on the calendar. Select the schedule, and in the Current Schedule section, add events to the schedule. Specify the event Description, Time, Audio file to be played, and the Page Zone. The chosen audio file will be playing over the network via multicast to all other Algo network devices that are configured as Slaves on this zone. The Scheduler can be deployed along with Algo IP speakers, paging adapters and strobes to provide bell scheduling and automated announcements. Once a bell schedule has been configured in the Schedules tab, it can be added to the desired dates on the calendar. Multiple different schedules can be created. For example, Fridays might have a different schedule than the other weekdays. From the drop down menu at the top of the calendar, select a schedule (e.g. Regular weekday), then click on the calendar dates to implement the schedule. When finished, click Save. To clear the schedule from the entire month, select None (clear) from the drop down menu, and click on the dates to clear. You can click All Weekdays or All instead of clicking individual dates to implement a specific schedule throughout the month or to clear existing schedule for the whole month. The schedule will need to be applied to each month separately. Allows a backup of the schedule with times and calendar dates to be downloaded for backup purposes. Note that this backup is independent from the rest of the configuration backup on the device. Upload and restore a saved Scheduler/Controller data file. 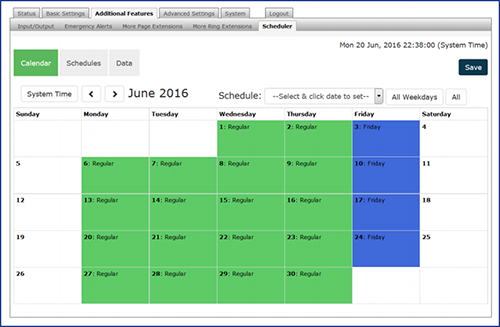 Clears all the Scheduler/Controller data, including saved schedules and set calendar dates.